Modern North facing 3 level fully furnished holiday home with fabulous views of the Mercury Islands. 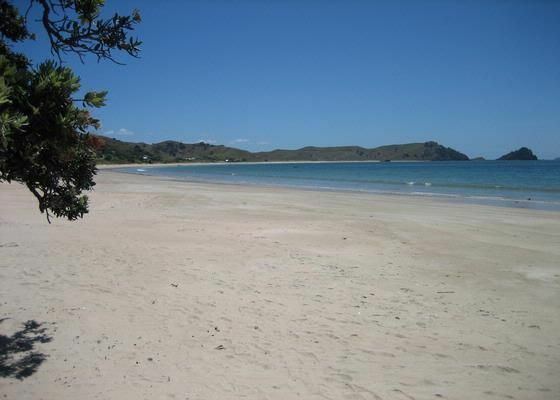 Two minutes walk from the beautiful sandy beach. Excellent fishing and diving spots minutes away. Great walking tracks nearby to take in the wonderful scenery. A great location for all, whether it is time away relaxing with family and friends soaking up the casual beach atmosphere of Opito Bay or serious fishing and diving time out around the Mercury Islands. A paradise for both kids and adults alike. Linen hireage and a cleaning service is available at an additional charge. Three nights minimum stay during shoulder season. Four nights minimum stay during peak season. Tarriff is based on 8 people but holiday home sleeps a maximum of 12 people. Family groups preferred. Lovely property ideal for our needs. Lovely property, plenty of rooms and space to spread. Joy and the local agent Colin were great; the bach was really well equipped and we had a wonderful time at Opito. The only glitch for us, coming from the UK, was that the website said that we had to bring our "own linen (towels/sheets/tea towels)", but in fact that was all provided. Thanks Denis for the great review. My apologies for not advising that you had the option to pay slightly extra to cover fully provided linen. Lots of room for everybody, great views and a very short stroll to the beach. We loved our stay. Thanks Katherine for the great review. We have always found that even with our large family group holidays there is always plenty of space. Glad you enjoyed your stay. Lovely communication for our last minute booking. The house is in a perfect spot, sea views and an easy short stroll to the beach. Just loved how it backed into the bush also. From the meet and greet with Colin handing over the keys, to the clean tidy and incredibly roomy Bach we cant fault a thing and so so want to come back. As for opito beach- it’s incredible- paradise . Amazing home very accommodating , everything you needed and was a property that was warm and homely. Amazing home very accommodating , everything you needed and was a property that was warm and homely. Location was brilliant plenty room for boats vechiles and amazing Veiw, close to beach , Property a credit to the owners also we had 12 people and did not feel at any moment that you were falling over each other. It's got the feeling of a true kiwi Bach/house but with space and comfort would totally recommend and would definintly return. Property was fantastic, great place, everything you need to have a wonderful holiday with family and freinds. Great house and freindly neighbours. Thank you, would like to come back sometime.